Holiday candle gifts are a great way to brighten up the season, whether you buy the candles you give or make them yourself. There are many different reasons to give candles as a gift. Candles are a quick and easy gift to give to coworkers, whether you're doing a secret Santa gift exchange or outfitting the whole office. Candles are a thoughtful hostess gift to give at holiday parties, or to people who you visit during the holiday season. If you're spending the night at a friend's house during the holidays, a gift basket including candles and bath goodies would be a welcome thank you. Of course, you can also give candles as gifts to family and friends. If you don't want to give all your friends cookies or hot chocolate mix, a candle is a great way to go. The first decision you need to make if you're considering giving holiday candle gifts this year is whether you want to make the candles yourself or if you would rather buy them from a store. If you need a large number of candles and your holiday party or event is coming up very soon, you may just want to buy candles to avoid any added stress. This is especially true if you're not very experienced as a candle maker. But, if you have a week or two to spare, it's easy to knock out a bunch of votive candles in Christmas colors that can be slipped into candle holders purchased in bulk at a craft store or home décor shop. You never know when someone you are planning to give candles to might be allergic to heavy fragrance, so keep that in mind when choosing candles to give as gifts. Plain white taper candles and lovely candle holders are a wonderful gift, even without fragrance. If you know the people you are shopping or crafting for don't mind scents, feel free to match the candle to the personality of the recipient. Popular scents that most people seem to like include vanilla, sandalwood, coffee and pumpkin. It's probably a good idea to stay away from floral scents, because people tend to have really passionate opinions about them. 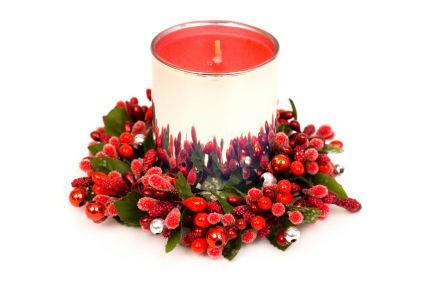 Color is another important consideration when choosing or crafting holiday candle gifts. If you are making or buying candles for both men and women, for example, you probably don't want to make all of your candles lavender. Holiday colors are usually popular with both sexes. If you're making candles yourself, you can even make lovely brown candles for the men on your list. Whether you buy a candle to give as a gift or make it yourself, it's not really a complete gift if you just give the candle. The point of gifting candles is that they can be immediately useful, put on the table tonight for dinner or lit in the bathroom through the party. Adding a candle holder or even a cute little decorative plate on which the candle can be burned makes the gift of a candle much more handy. The candle holder can be related to the holiday or season, or it can be a simple design that the recipient will want to use all year. You can also throw in a box of long matches or a candle lighter, or even a candle snuffer (if giving taper candles) to make the gift more complete. No matter what you add to the gift of a candle, it is sure to be appreciated.